Where did you grow up? How did you get into your profession? We both grew up in the Depew/Lancaster area. Last year, after a trip to a city that had plenty of healthy options, we decided that Buffalo needed more convenience when it came to eating healthy. So we used all our resources to create the first healthy food truck and now we have a stand in the Ellicott Square Food Court. We started the juice truck in July, and now we have a delivery truck and cafe/stand. We have put all our resources into making healthy eating easier for people in the Western New York area and the “thank yous” we have received from customers make it all worth it. We hope to keep growing and adding as much as we have in the past 6 months. Hearing the success stories from people who come to our truck or stand and let us know what eating healthy has done for them. We have heard many inspiring stories from people who have eased illnesses or just acquired more energy from eating delicious food from the natural world. What is your favorite juice/smoothie recipe? Mike: My favorite smoothie would be Blueberry Matcha because of the amount of anti-oxidants in it, and my favorite juice is the Lemonade because you’re getting some apple cider vinegar in the most delicious way. Jeremy: Clean Green because every single ingredient is healthy for you and any time you can get some spirulina in you, you should. What is one menu item you are most excited to offer? Bone Broth. 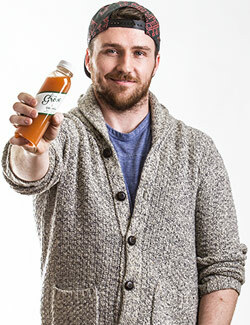 We love our juices and smoothies, but the healthiest drink we have on the menu is the bone broth. It’s packed with minerals and is surprisingly tasty with some pink salt and spices added in!